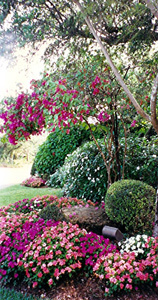 ..:: Creating beautiful landscapes for commercial and residential clients | Southwest ranches, South Florida ::.. Since 1998 Tropical Touch Garden Center located in South West Ranches, South Florida has been truly specialists in designing, installing and maintaining attractive outdoor commercial and residential landscapes. From concept to completion we are committed to client service and our success is measured by our client's satisfaction and the quality of our landscape projects. With over 12 years of experience working with architects, developers, contracting companies, cities and counties, we have earned a reputation for the quality and professionalism of our work. As an organization, we evaluate our work methods and ethics along with the choices we make in pursuit of total satisfaction to our clients and the communities we service. Our employees are equipped with the latest industry tools available to provide an efficient and safe service. Furthermore, for your protection, our employees will always be easily identifiable wearing our company uniforms and safety vests. As a Tropical Touch Garden Center client, you'll appreciate the professional appearance of our equipment, machinery and our crews. Our vehicles are clean and well maintained and a professional appearance is a special source of pride for our field crews, who arrive in neat, clean uniforms bearing our company name and logo. We have all the necessary State and County permits and licenses needed to fully take care of all aspects of your landscape. Tropical Touch Garden Center also carries the highest liability protection insurance which is required when doing business with Cities or other Government entities. Contracts detail every aspect of the proposed work, the timetable, the cost and any ongoing service contracts. Business License is issued by the Broward, Miami-Dade and West Palm Beach Counties in which we do business. Insurance - General liability and worker's compensation Insurance with limits of $3 million and $1million respectively. Being a proud member of Lawn and Horticultural organizations helps us achieve knowledge of products and industry standards. Service - You deserve a landscape company that is responsive to you! Our team is directly responsible for scheduling, production, and quality control. As a result, they will react quickly and efficiently to your request. Creativity - The difference between ordinary and extraordinary is "that little extra". Our extensive knowledge of plant material, color, and texture combined with our knowledge of plant performance guarantees traffic stopping color displays. Warranty - You will receive a minimum warranty of 6 months on all palms and trees with an option to extend the warranty to 12 months. We will replace the plant with another of the exact same size, even if we need to cart in a new palm using a crane rather than damaging your new garden. We have clients who can vouch for this! Experience - Our projects have been featured on Channel 4 and have appeared in the Miami Herald and several magazines. Tropical Touch Garden Center has over 12 years of experience. Teamwork - We are a team of professionals who demand excellence and provide quality beyond expectations. Tropical Touch Garden Center will work with you to meet your goals. Our landscape team and maintenance managers are committed to the idea that "Together Everyone Achieves More". Results - We strive to meet your objectives as well as those of your property managers, asset managers, and owners. The result will be an exterior environment that is pleasing to tenants and will maximize the investment of clients.